"I just got our order for multi-level embossed business cards and nearly squealed they are so incredibly awesome! Thank you so much!" Embossing gives brochures an interesting texture that just begs to be touched. Embossing uses a pair of dies to create a raised image on paper. The male, or bas relief, die presses up, while the female, mold shaped, die presses down. The resulting image pops out on one side and has an interesting recessed (or debossed) look on the other. Embossing has long been used for raised seals on official documents, and it can give brochures that same elegant and timeless look. But embossing also looks great with bold text and modern graphics. Embossing can be used alone (known as "blind embossing"), or it can be combined with foil stamping or specialty inks to create a 3-D effect that seems to lift text and images right off your paper. The reverse side of embossing is indented, and text and images won't print well there. Design your brochure so you can leave the debossed area blank without it looking awkward. Embossing can create a high level of detail on some papers, while other papers will produce a bolder, deeper image. Brochures are a popular way to describe products, businesses, and services brochures are also great for presentation handouts, menus, maps and resumes. Because brochures have plenty of space, they're a good choice for detailed product information, your company story, or a glossy photo spread. Take advantage of the extra space, but keep the look clean and easy to read. Give your readers enough information to spark their interest, but don't overwhelm them with too much detail. Give your brochure a strong call to action that clearly tells readers what you want them to do next. Whether it's call to order!,visit our website to learn more or please RSVP, place embossing near the call to action to help draw attention to it and encourage your readers to act. If you'll be mailing your brochure, put the embossing on the front or back of the folded piece. The raised texture will instantly stand out in your recipients' hands, inviting them to look inside. Use embossing in combination with die cutting to create a three dimensional image at the top or front flap of your brochure. People love to interact with shapes and textures, and embossing combined with die cutting helps ensure your brochure will be read, saved and shared. Use embossing to project an elegant, upscale image. Embossing says "quality" on brochures for high-end products and professional services. Embossing makes invitations to fundraisers and other events feel special. Combine embossing with foil stamping to give your graphics an irresistible 3D effect. Embossing makes ordinary brochures upscale and touchable. 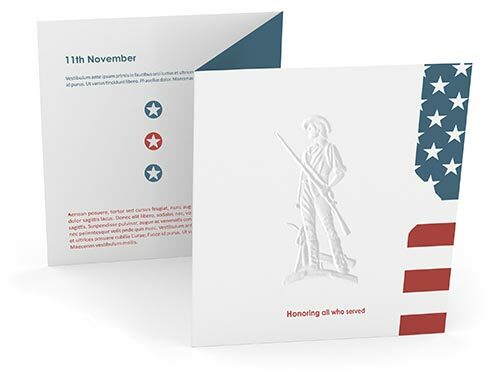 When combined with other techniques such as foil stamping or die cutting, embossing creates a memorable brochure that people can't wait to get their hands on. 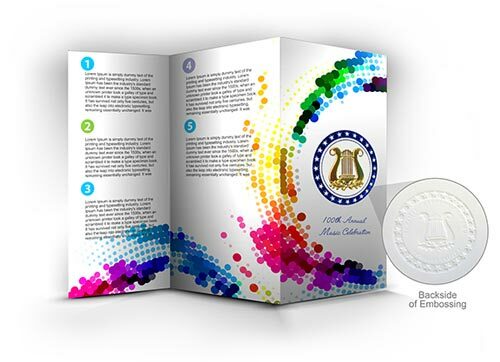 Need technical or creative advice on your embossed brochure project?